Before you continue reading, I feel the need to let you know that this was reviewed using a review code provided by the developer and or a PR company. Imagine that ten seconds of light is the only thing separating you and certain doom, but using said light could also cost you everything. Do you have the courage to risk all your hard work or would you instead walk blindly into the great unknown? I often find myself pondering what I would do in that situation, or at least I did until I got my hands on Candleman and found out that light’s for chumps. 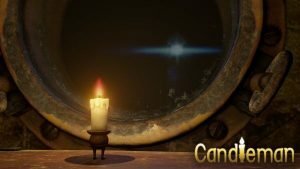 Candleman is an Indie 3D platformer developed by Spotlightor Interactive, in which you play as an inquisitive Candle pondering the meaning of life. And with that odd premise you set out on a journey of sometimes lackluster visuals, but one that’s rewarding nonetheless. The story of Candleman is quite simple, after spotting a lighthouse in the distance a sentient Candle strives to become one. On your way towards your goal you must navigate through twelve different biomes that each hold their own set of unique challenges. In my roughly four hours with the game I found myself asking the same question over and over again. How the hell does this Candle know what a lighthouse is? If I had never seen nor heard of a lighthouse before and someone pointed one out to me, I wouldn’t immediately say “oh man what an amazing lighthouse, I’d really like to see it up close.” I’d probably be too dumbfounded on how this phallic building is emitting such a large amount of light and move on. But I guess that’s why I’m writing this instead of embarking on a quest to become a lighthouse keeper. I honestly found the story somewhat underwhelming, at least when stacked up next to recent platformers such as Celeste. It never really struck a chord with me, which is quite odd; normally when I play games I do so for the story. The only time I ever found myself feeling anything for this little Candle and his plight is when I had used up most of my wax, reducing him to just a little nubbin with legs. I think that this is in large part due to the inconsistent and underwhelming visuals. 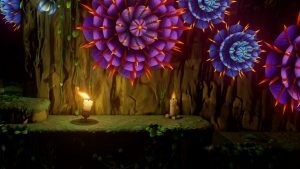 Many of the environments in Candleman are truly beautiful. Such as chapters 4 through 6 when you must maneuver through a dark forest, waterway, and meadow, all the while being assaulted by dangerous plants and animals that react to your light. With bright and vibrant colors these plants and animals offer a direct contrast to their dark and often depressing backgrounds. But sadly not all the visuals in Candleman hold up to the standard set by these areas. The biggest culprit in my opinion is the scene when your small candle sets his eyes on the lighthouse. When first spotting the lighthouse through the porthole I could absolutely see what the developers were hoping to do in this scene. After becoming aware of his existence the Candle wanders alone through a dark world until he finally gets a glimpse of light and knows he’s not alone in the universe. This is obviously meant to be the call to action that stokes the fires in any players heart. But when looking at the lighthouse I instead found myself asking why it was so damn depressing and in turn wondering why this Candle would aspire to become such a thing. It’s like asking me to be invested in someone’s adventure after witnessing them stare at a rock. But if instead this lighthouse was beautiful and majestic (like the aforementioned plants and animals) I think I would’ve been able to align myself with this candle’s lofty goals. Luckily the platforming in many of the chapters was enough to make it all worthwhile. With the exception of chapter 2 (arguably the worst chapter in the game) each and every chapter of Candleman was just challenging enough to keep me playing. Between both navigating hazardous zones and using what small amount of light given to me, I emerged after beating each chapter feeling good about what I had accomplished. The one indifference I have with Candleman’s gameplay is the amount of lives given to you. At the beginning of each level you have ten lives which in most cases is more than enough, but in later chapters when your reflexes are put to the test I found myself wishing I had more, where the inverse is true in early chapters. In early chapters the difficulty is almost nonexistent, so when you’re given ten lives to complete them it comes across as hand holding and takes away from any sense of accomplishment I might have had otherwise. All in all Candleman is definitely a worthwhile experience for any fan of 3D platformers and or completionists. Even though I found the story and visuals somewhat underwhelming, the platforming and easily obtained platinum more than made up for those faults.